Social media is a constant conversation starter in our office. With Facebook announcing algorithm changes, social media channels making updates to their ad platforms and new research about the latest trends, something is always in flux in the social world. These discussions led our team to ask questions about social media trends across the United States. In our day-to-day lives working with clients on social strategy, we didn't see support for all of the social media trends we had heard about. Twitter was performing very well for some of our clients, and Facebook was still a great way for us to reach young adults. So that got us thinking... How does Iowa stack up with the trends regarding social media habits? There is a lot of information available about the demographics of social media users overall. Social media platforms are eager to share how many millions of users they have and market research firms put out statistics on the most used social media platforms worldwide by age group. But we found localized data to be lacking. We were hearing claims flying around like “young adults are abandoning Facebook,” but we hadn’t seen any data proving these trends were true in Iowa. Many of our clients are local businesses, so it is important for us to know how Iowans interact with social media. These looming questions led us to conduct our own market research using an online survey to learn more about social media habits in Iowa. We were most interested in learning about the social media habits of users ages 18 to 44, so we limited our survey to this age range. Why did we choose this age range? Individuals under age 18 have very little purchasing power on social media, which is important to our clients. Individuals above age 44 have fairly consistent social media habits as they remain heavy Facebook users. Most of the unanswered questions we had were driven by the habits of younger social media users. Here are the key takeaways that we discovered and know other marketers in Iowa can learn from. With Instagram's rapid growth, is it now Iowans' favorite social platform? Facebook was the clear winner as the favorite social media platform amongst Iowans. 43% of respondents said Facebook was their favorite platform, while only 8% chose Instagram as their favorite social media platform. We also found that people are significantly more likely to spend the most time on Facebook in comparison to other popular social sites. 52% of respondents said they spend the most time on Facebook, and only 10% of respondents overall selected Instagram. Is it true that young adults in Iowa are abandoning Facebook? Finally, one of our biggest questions was debunked! 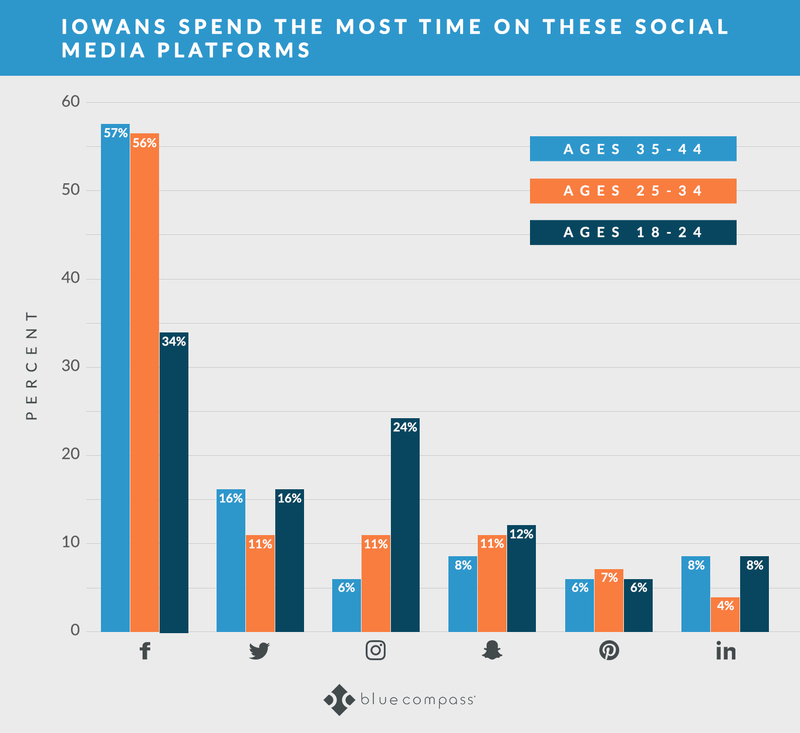 Despite hearing lots of uproar about young people abandoning Facebook, 31% of 18-24-year-olds in Iowa still choose Facebook as the favorite social media platform. We were also surprised to see that only 15% of respondents in this age group chose Instagram as the favorite and only 6% selected Snapchat. But are young Iowans really spending time on Facebook? Yes, 34% of respondents ages 18-24 spend the most time on Facebook. Although young adults in Iowa are spending a great deal of time on Facebook, a recent national study conducted by EMarketer, a forecasting analyst, found that teens seemed less engaged with Facebook and were logging in less often. While we didn’t survey about engagement, we did discover that young adults in Iowa have Facebook top of mind when selecting a social media channel with which they spend the most time. 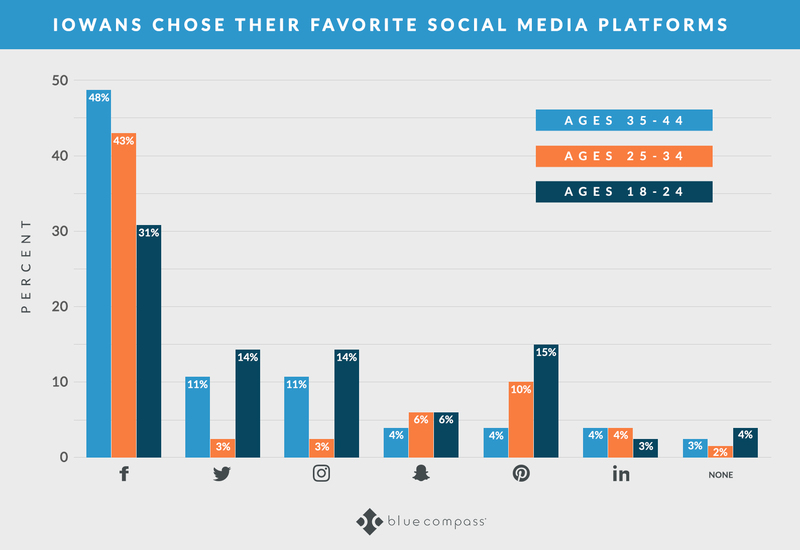 Overall, and in every age group and gender, Facebook was the favorite social media site with 43% of respondents choosing it as their favorite platform. Even more interesting was the respondents' lack of preference for a social site, with 28% responding, “none.” Twitter and Instagram followed with 9% and 8%, respectively. Is Twitter really dying off? No, Twitter is not dead. While Twitter was not considered the favorite among a majority of respondents, people are spending a significant amount of time on Twitter, because they are using Twitter as a timely news source. What did the data show us? Only 3% of 25-34-year-olds selected Twitter, significantly lower than both of the other age groups. Despite Twitter not being the favorite social media channel, 15% of users said they spend the most time with Twitter - second only to Facebook at 52%. Of the participants who chose Twitter as their favorite platform, 51% said they prefer to see information articles on social media. What types of content do Iowans like to see on social media? Next, we wanted to find out what type of content people most liked to see on various social media platforms. Knowing where people spend their time on social is great, but if we can understand their favorite kinds of content, we can customize our strategies even further. Overall, 51% of respondents liked to see photos and 45% liked to see informational articles or blogs. However, this answer varied across age groups. 27% of 18-24-year-olds preferred to see videos on social media, while 52% of 35-44-year-olds preferred to view informational articles and blogs on social media. How does preferred content correlate with favorite social media sites? Unsurprisingly, people who liked Facebook, Snapchat and Instagram the most wanted to see photos on social media. Twitter, Pinterest and LinkedIn fans preferred to see informational articles. This was a great reminder to us that social strategies should vary from platform to platform. When we post on social media, we make sure we always vary the text and images even if we are sharing the same content. Does Pinterest still dominate the young college marketplace in Iowa? Pinterest was selected as the favorite social media site by 4% of respondents. Only 3% of 18-24-year-olds selected Pinterest as their favorite social media site, fewer than any of the other social media sites included in our survey. 18-24-year-olds also spend the least time with Pinterest when compared to all other platforms. Even though Pinterest wasn’t a favorite social channel for many users, 23% of users feel comfortable buying from Pinterest, which leads us to our next question. Which social media sites do Iowans feel comfortable buying from? 47% of respondents felt comfortable buying from Facebook. After Pinterest (23%), 15% of respondents felt comfortable buying from Instagram. How does this line up with data collected nationally? According to data collected by Statista, 48% of social media users 18 and older in the United States made their most recent social media purchase from Facebook, followed by 8.6% from Instagram, 4.5% from YouTube and 2.1% from Pinterest. While we did not survey users about their last purchase, Iowa aligns with national trends of being comfortable purchasing on Facebook. Was Snapchat the only thing 18-24-year-olds liked? It’s clear from the results that Snapchat is not the only channel this age group likes, but it should not be overlooked because young adults are spending a lot of time on Snapchat. While only 6% of 18-24-year-olds selected Snapchat as their favorite social site, 24% reported liking to spend the most time with it, indicating to us that Snapchat is an important social channel for sharing content aimed at this younger age group. We gleaned many insights from conducting this survey, and we want to share them so other marketers can improve their strategy to reach target audiences. Aside from answering a few of our major questions about social media usage across the state, we were able to learn quite a bit about the social media sites Iowans check the most and what types of content they like to interact with. 62% of respondents check Facebook at least once a month, followed by 32% for Instagram and 29% for Snapchat. Data from Pew Research Center indicates that 74% of Facebook users check the site daily, followed by 63% of Snapchat users and 60% of Instagram users. The results from the Iowa case study vary slightly from the national research, but Facebook, Instagram and Snapchat are the top three most checked sites on a local and national basis. What do we think of these social media findings? Frankly, we were surprised by some of the findings, but we’re excited to continue monitoring these trends. In Iowa, Facebook is still the favorite across all age groups we surveyed. With over 159 million users in the United States, we find it hard to believe that Facebook is going to die anytime soon, even for young adults. Over the next few years, we are excited to see if young adults use Facebook in new ways. Facebook’s recent algorithm change reduced the reach of business content that has limited engagement. This has increased the necessity of paid promotions and has made it more important than ever to use photos and videos to increase organic reach. How will Twitter continue to evolve as a news source? Twitter is not dead but, for some people, its purpose has evolved. Iowans on Twitter were most interested in informative articles and Twitter is the perfect platform for receiving timely updates on news across the country and world. According to Pew Research Center, 74% of Twitter users get news there, higher than any of the other social media sites included in their research. Our findings reminded us that people search for different types of content on each platform. While people like to see photos and videos on Snapchat and Facebook, they prefer to see informational articles on LinkedIn and Twitter. Why does this matter to us as marketers? Social strategy should vary from platform to platform. When we post on social media, we make sure always to vary the text and images even if we are sharing the same content. Often, we don’t even share the same content on all social channels. While we frequently share industry-relevant news from some of our favorite sources on Twitter, we focus more on our culture and expertise on Instagram. Does Snapchat really matter for businesses? This one isn’t quite as simple as yes or no, but we’ll share our thoughts. If you’re trying to reach 18-24-year-olds, they spend a lot of time on Snapchat. In our experience, people like Snapchat because they can interact with their friends and businesses in a more informal way than other platforms provide. In fact, according to research from CivicScience 28% of online Millennials check Snapchat every day. So if young adults are one of your target audiences, try Snapchat and be authentic. At Blue Compass, we don’t like shooting in the dark when it comes to digital marketing. We are data-driven marketers who make decisions that are backed by analytics and strategic market research. We performed this Iowa social media case study so we could use the results to develop better social media strategies for our clients. And that’s what we plan to do! If you’re interested in revamping your social media strategy, we’re happy to see how we can help.